With this being the inaugural running of the Stampede obstacle course race in Louisville, KY, I didn’t quite know what to expect. I have always (I say that like I’ve been racing for more than 11 months) run in races that have been well-established, so I expected there to be a few glitches. Surprisingly enough, there really weren’t any of major significance. I was slightly apprehensive when Jill told my wife and I that we were .2 miles from the race site. Jill is the name that we have given our GPS. Yes, she is female. You just can’t trust guys with directions if you want to get anywhere on time. Anyway, we were on this rural country road and at that precise moment, I wasn’t seeing anything that remotely looked like an obstacle course racing site. I turned to my wife and said “is the race in some dude’s backyard?” As soon as I finished saying that, I was relieved to see a big farm with cars in the process of parking in the middle of a well-groomed hay field located about 100 yards from registration. I surveyed the land and excitement ensued when I saw an abundance of hills and trees. This was a simple race. No glitz. No glamour. No problem. 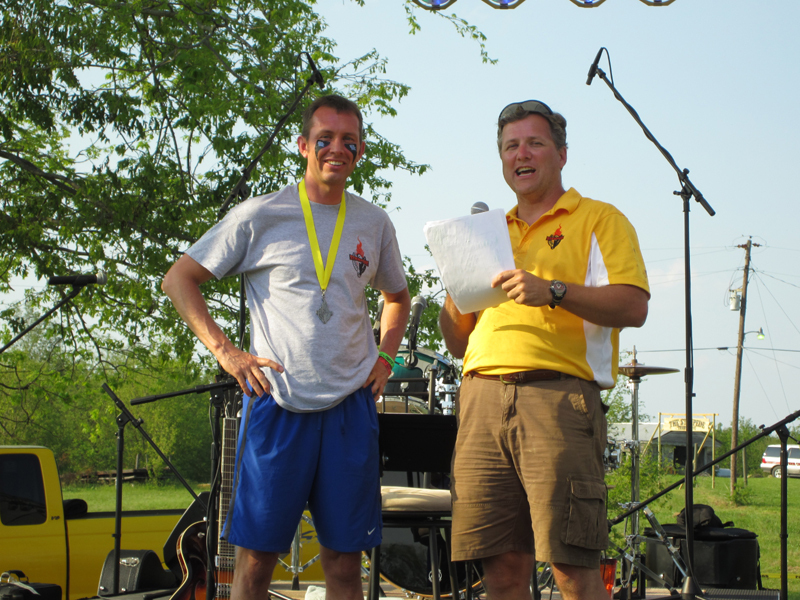 It was not put on by an event company, but by a race director with lots of help from his friends. Registration, although not super-quick, was smooth and anyone in a rush to get to the starting line was accommodated. 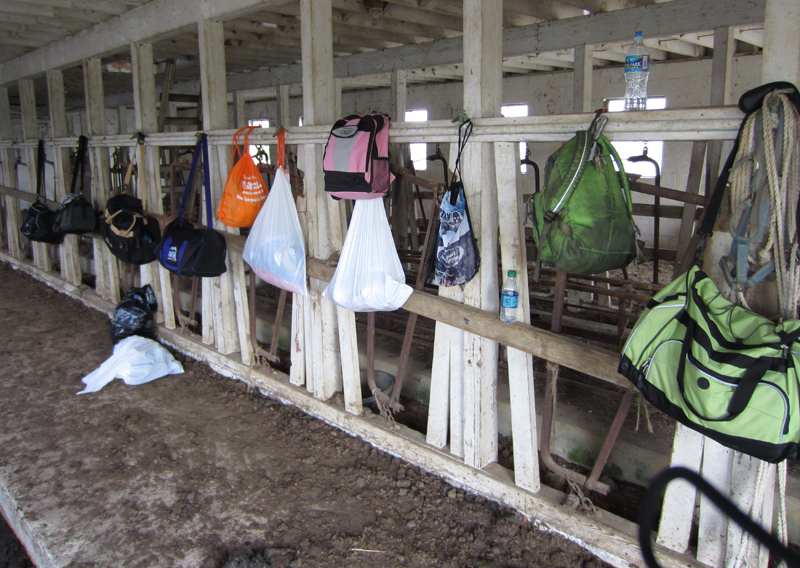 The bag check was 100% pure Kentucky. Just an old barn complete with dried manure on the floors. Sometimes, I think race directors get overly concerned with setups, galleries, and man-made obstacles. I personally prefer the unadorned, natural grit of a race site and can do without all the tents and displays. I come to race and as long as that goes well, then I’m pretty much okay with a simple gallery. One of the things that made this race appealing to me is that the race director and all the volunteers were friendly and welcoming. They all made a point to seek out criticisms so the race could be improved in the future. I heard this uttered. not once, not twice, but multiple times. 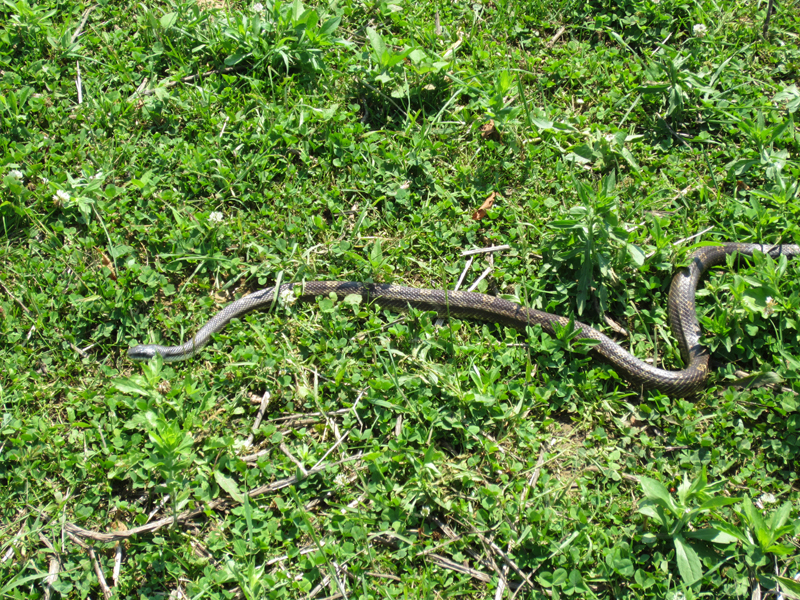 The course itself was a winding trip through woods, hills, creeks, and ravines and came complete with its own snake slithering around the starting gate. Although not the hilliest that I have encountered, it had more than enough to separate out the serious from the playful. There was a good mix of challenging and easy obstacles that could be conquered by racers of just about any level. It was billed as a family race course and I think they nailed it. While the obstacles weren’t extreme, I was glad when I reached the finish line. There were a couple of issues with course markings in the beginning. My wife actually took a wrong turn and beat me back to the finish line by several minutes! However, this was pointed out and the race officials quickly took care of it. I really can’t say enough about how accommodating the race officials were. They let encouraged April to run the full course again with me running with her. Even the food vendor was accommodating as she fixed me a custom grilled vegetables and chicken meal! I’m extremely picky about the foods I consume and she quickly picked up on that and offered a special dish cooked to my specifications. That just doesn’t happen at most races. I have high expectations for the second running of this race. I’m pretty confident that the course will be even better next year with new and more obstacles. I also expect the number of racers to increase, given that there will be more time to advertise and other racers like me promoting it. Although the numbers were probably in the low-mid hundreds this year, I will not be surprised if there are a thousand racers next year. 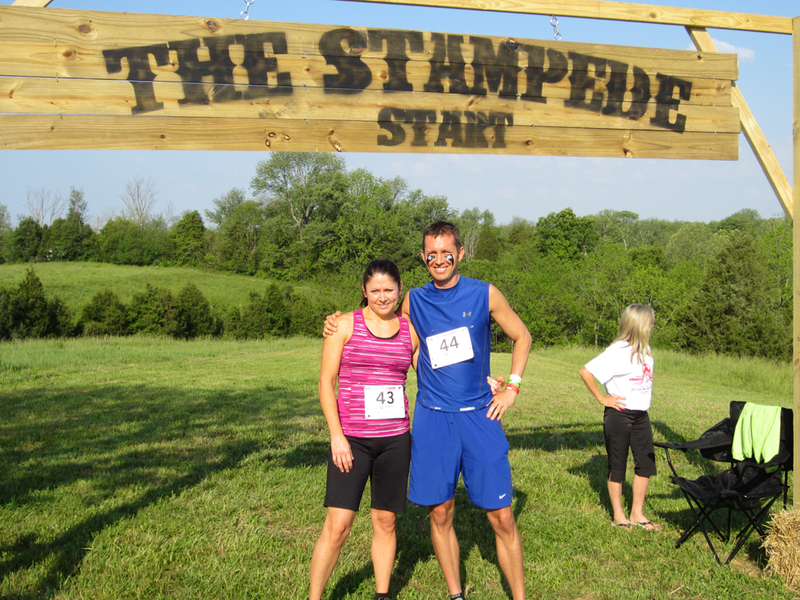 If you’re reading this and considering the 2013 Stampede, then by all means, give it a shot! Before I start this race recap, I’m obliged to thank one of my physical therapists for getting my knee ready for this race. Yes, you heard that right I have TWO PTs. Stacey works on my knee and Kelly works on my shoulder. Oh, and I have a chiropractor too. I’m that banged up. I came into this race with no real speed training in over two weeks recovering from knee bursitis caused by a tight iliotibial band. I know most people call it the “IT Band”, but I actually know the correct term AND can pronounce, so I prefer “iliotibial.” When the bugle sounded the Call to the Post the pre-race jitterbugs started having a party in my stomach. I fist-bumped my racing wife (as opposed to my non-racing wife?? That sounds silly, but I’m leaving in the post), lined up at the front of the starting line, and shut everything else out of my mind. When the starting gun sounded, I shot out like a bullet (get it..gun/bullet?!) Even though I didn’t really tell anyone beforehand, I came to this race with the intentions of winning it. At the same time, though, I only gave myself a 50-50 chance of doing so. Anything can happen. In a speed race, I did not want to get caught up in race traffic or hindered at the obstacles, which is why I started in an all-out sprint. One of the first obstacles was a crawl through a truck tire hanging from a beam. I never know if I should go head first through those types of obstacles or grab at top and swing my legs through first. I’m pretty sure I’m doing something wrong because that never goes smoothly for me. If anyone has a good strategy, let me know. The hills quickly came into play and the first challenging obstacle came at the top of an uphill climb where racers had to leap/climb/scramble up a round bale of hay. My strategy worked. I had gotten out in front and led the entire race, but found myself in unfamiliar territory by leading the pack. There were a few instances at which I had to slow down to figure out which way to go. A couple of those times I made a bad decision, including the time missed the exit point from a ravine and ran several yards past it to an obvious dead end. I think that is when I yelled out “WHICH WAY AM I SUPPOSED TO GO!” There was no one around to answer. I won’t detail all the obstacles, but a few things stood out to me. There were the usual mud holes/pits, hill climbs and descents, gorges to jump, and walls to climb. I think my favorite obstacles were the rope climbs out of the ravines. One of them was longer and sloped. The other was only about 6 feet tall, but straight up a muddy embankment. There were some longer stretches of runs through the hay fields, which suited real runners, so I had to mentally push myself to go as fast as possible on those. Even though I had a substantial lead in my heat, there were hundreds of more racers to follow and I didn’t want to give away any precious seconds. Although not the most difficult course I’ve run, I was certainly glad to see the final obstacles. First, there was a slip-n-slide down a small hill into a big mud hole. Nice way to catch your breath! I got stuck midway and had to get up, run, and slide again to make it to the bottom. Slosh out of the mud hole, crawl under more ropes through some thick and really smelly mud. Run up a hill and cross the finish line. Done! Exhausted! Could barely breathe! Final time was 32:21. I wasn’t sure how that would hold up, but I don’t think I could have run it much faster. AND I didn’t fall down even one time, which I think is a first for me!!! Six hours later, my time was confirmed as the best and I finished a minute or so faster than second place. Goal accomplished! My second trip to a podium and my first (and hopefully not last) win! As with most races, I met some new people (Chad, Kirk, & Kelly) that I hope to race with again soon. I’m continually amazed at the quality of people that run in obstacle races. I’m blessed that this is now my sport of choice. 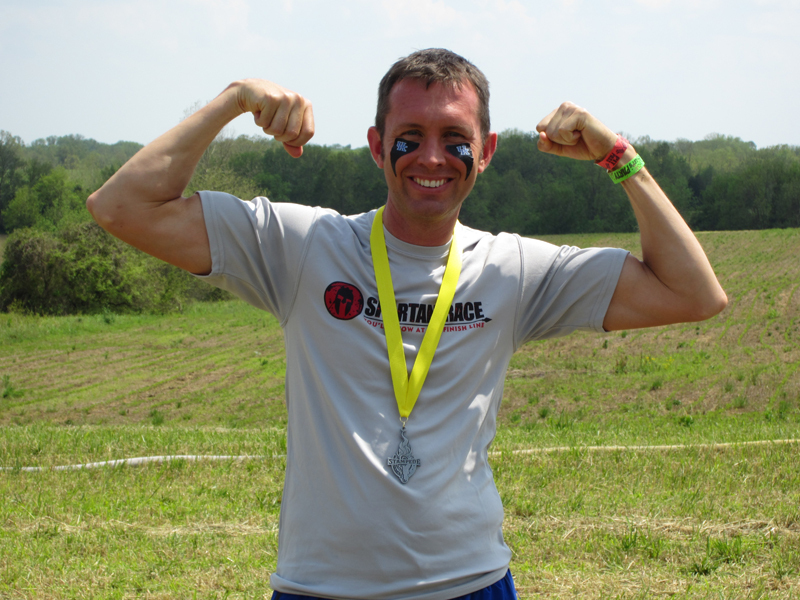 My dorky post-race flex pose! It’s tradition now. Nice review Jeff!! It was nice meeting you and your wife as wife as well. See ya in Lebanon? Great Race Jeff, You have only driven us to new hieghts for 2013. Congrats on your well deserved win. Now, we have begun our Urban Stampede Race details for August 11, 2013. It is turning out to be yet another fun and exciting venue for us. Can you Survive The Stampede?